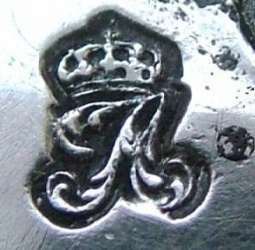 Among the objects of the French "Ancien Régime", the production of the long reign of King Louis XV (1722-1774) is the most frequent victim of forgeries and fraudulent attributions. This phenomenon, interesting particularly the furniture, widely affects also the silverware, with a special predilection for the prestigious production of Paris. Fortunately, the forgers rarely have a deep knowledge of the characteristics of the object that they falsify. The results of this ignorance, combined with the limited time available, are the numerous errors present in their forgeries. 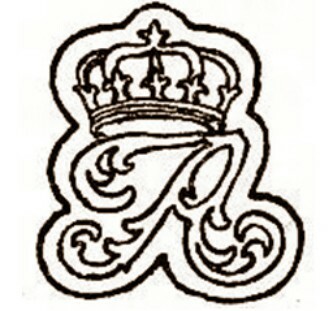 The example below illustrates a manifest error committed in the imitation of a French hallmark. The object interested to the forgery is a cup with a heavy chasing decoration (quite far from French taste of that period), attributed to Paris 1768-1774 production. 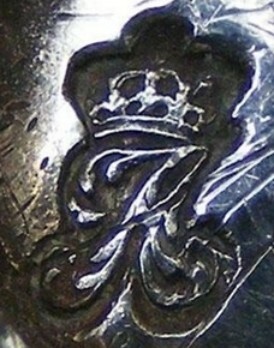 The cup bears also a 19th century French import mark. A meager consolation for the unfortunate owner of this piece. Through this mark he obtains only the confirm of the silver fineness (sterling) of his object. The mark that allows the identification of the fraud is the "poinçon de Charge de Paris", used in Paris from 1768 to 1774. 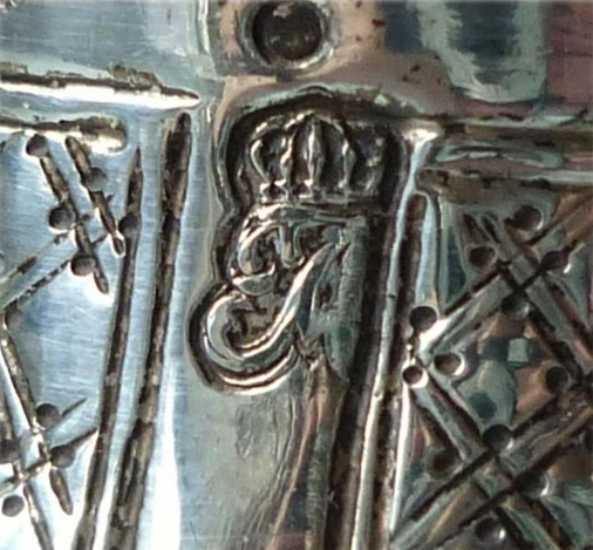 The "Charge" is a tax mark engaging the silversmith to pay the fee when the piece is finished and ready to be sold. 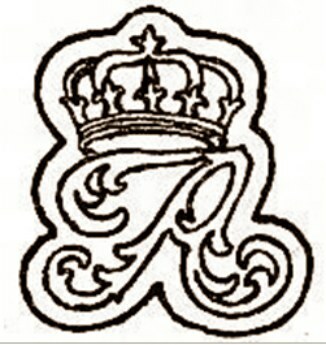 Various images of authentic marks are illustrated below. 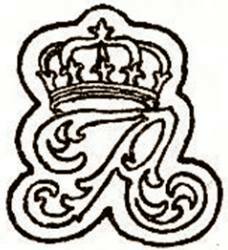 Since 1672, when was introduced the tax on the silverware (the "Droit de Marque"), Paris used in its mark the letter "A", crowned and highly stylized. 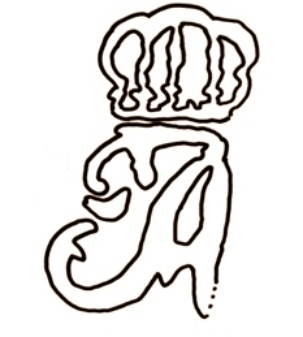 This mark was subject to changes every six years, in its shape and calligraphy. 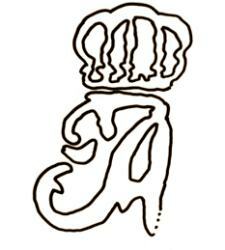 Here below are illustrated various marks used in the period 1768-1774. A superficial examination of the mark could, in good faith, attribute the object to Paris, 1768-1774 production. Unfortunately it is a fake, as can be demonstrated at a closer look. 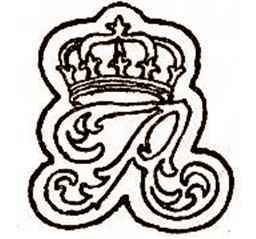 - the proportions of the crown do not respect the scheme and it results oversized high. On the contrary, the five "fleur-de-lys" on the base are much smaller than the reference pattern. 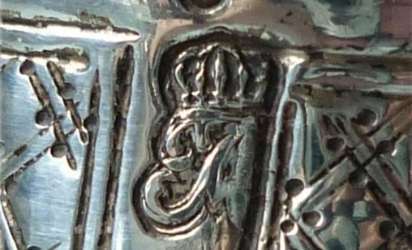 Ultimately, this is a fraud less dangerous of other forgeries involving the chiselling (instead of the punching) of well known French hallmarks. The latter are more difficult to identify!